We are HOPPY to announce our official ribbon cutting ceremony Thursday, March 29th from 4-5pm. Come celebrate the hatching and growth of Bargain Baby at 152-154 Main Street, Oneonta! There will be light refreshments, and a mini Easter egg hunt for the little ones! Stop in and grab your last-minute Easter outfit/gift all while celebrating and experiencing EGGCELLENT bargains! For more information, contact [email protected] or (607) 432-0960, or visit www.OneontaHistory.org. The Greater Oneonta Historical Society (GOHS) is sponsoring a full-day trip to Hammondsport and Corning on Tuesday May 15 in a Hale Transportation bus. This trip will give participants the opportunity to tour both the Curtiss Museum in Hammondsport and the Corning Museum of Glass in Corning. The Curtiss Museum features displays of early aircraft, motorcycles, and engines, many of which were manufactured in the Hammondsport factory of aviation pioneer Glenn H. Curtiss. Also on display are Curtiss family art and turn of the century furnishings and memorabilia. The Corning Museum of Glass, where participants will have a two-hour guided tour, is well-known for its comprehensive glass collection representing 35 centuries of glass from around the world. One of the special exhibitions in May will be “Curious & Curiouser: Surprising Finds from the Rakow Library”. The Juliette K. & Leonard S. Rakow Research Library of the Corning Museum of Glass is the world’s foremost library on the art and history of glass and glass making. Registration forms are available at www.OneontaHistory.org, at GOHS’ Facebook page, and at the Oneonta History Center, 183 Main Street. The cost of the trip is $90.00 and the registration deadline is April 24. Part of the registration fee will be a donation to GOHS. For more information, call Bill or Marge Pietraface at (607) 432-1385. DJ Mark LaValley will play all your favorite tunes to make your evening a memorable one. Join him in the Hawkeye from 9 pm until midnight. DJ John Thompson began performing professionally as a drummer and guitarist at the early age of thirteen. As a musician, he takes great pride in the various genres and bands he has played with. Through his craft as a musician, he’s adapted this knowledge to being a skilled and entertaining DJ. Many guests have said DJ John Thompson recognizes and finds the songs that are “just right” for the moment and “keeps the dance floor fun and alive.” Playing songs from the big band era through early rock ‘n roll, country, Latin, Motown, and disco to the latest and hottest dance songs, John always welcomes and encourages requests. Join him tonight from 9 pm to 1 am in the Hawkeye. DJ Raphael is a dynamic and creatively versatile entertainer whose musical tastes are wide and varied. Focusing on most things soulful, Raphael plays music with instrumental and vocal class dipping into different genres and vibes. Join him in the Hawkeye from 9 pm – 1 am. Enjoy a bountiful brunch in the elegant setting of Glimmerglass overlooking Lake Otsego. Featuring omelets made to order, carving station, waffles and classic breakfast foods, salads station, delectable desserts, kid-friendly classics, and much more. $34.95 per person ($18.00 for children 3-12 years old). Served 11:30 am to 2:00 pm. Reservations required. Call 607-544-2519 for information and reservations. programs over the years from lake management to solid waste improvements and everything in between. 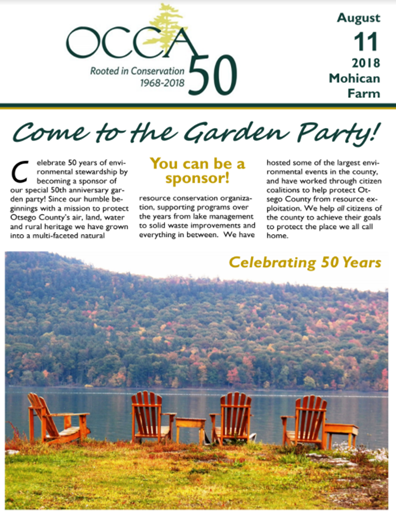 We have hosted some of the largest environmental events in the county, and have worked through citizen coalitions to help protect Otsego County from resource exploitation. We help all citizens of the county to achieve their goals to protect the place we all call home. You can be a sponsor! The 2018 Job Fair is for job seekers who seek to be employed immediately. To assist the residents of the Chenango, Delaware and Otsego area in this process, The Otsego County Chamber of Commerce, is pleased to host the 2018 Job Fair, Saturday, April 14, 2018 at the Fox Care Center, Oneonta, NY. • Education – Training providers will promote training opportunities for individuals to gain the skills and knowledge to help them succeed in their careers. • Employment – Businesses will offer career information and local employment opportunities. The success of this effort is dependent on support from many partners. As an event sponsor, your firm will have the opportunity for increased visibility within the local community while at the same time providing a benefit to your organizations recruitment efforts. We appreciate your support for this and other past events and hope you will join us in sponsoring this year’s Otsego County Chamber of Commerce 2018 Job Fair, Saturday, April 14, 2018 at the Fox Care Center. Attached please find Job Fair Sponsorship and registration forms.